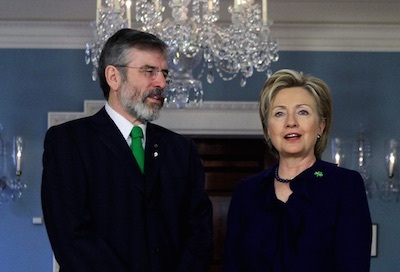 Political activity in the north of Ireland was unexpectedly set back this week when the US State Department cancelled a meeting with Sinn Fein President Gerry Adams in Washington DC. The state department said it postponed a meeting between Mr Adams and deputy secretary of state Tony Blinken because of the ongoing negotiations on welfare cuts in Belfast. Departmental spokeswoman Jen Psaki said all meetings on the political crisis in the Six Counties had been cancelled ‘until such agreement (on welfare cuts) is reached’. Mr Adams instead met the US deputy assistant secretary for European and Eurasia Affairs on Tuesday. He later accused the US State Department of “hokey pokey diplomacy”. “The State Department’s handling of the issue of a meeting with me is bizarre,” he said. Mr Adams said he also raised outstanding issues arising from other agreements, including the British government’s failure to honour its commitment to hold an inquiry into the murder of Pat Finucane, and the need for a Bill of Rights. And he also spoke about the undocumented Irish, supporting the call for visa waivers that would allow illegal immigrants to return to Ireland without facing travel bans. A political deadlock in the US parliament has been blamed by White House officials for the failure to advance recent promises of immigration reform. But at the White House, where the traditional shamrock-giving ceremony was held, there was surprisingly little concern for the Stormont crisis. The dispute flared last week when Sinn Fein withdrew support for welfare legislation over clear signals that funds earmarked for those losing out under benefits system changes would not cover new claimants, as they had promised their supporters. The party said an extra 200 million pounds was needed to plug a funding gap in the pre-Christmas Stormont House deal in order to prevent cuts to social welfare benefits. Asked after meeting Mr Obama what the president had said about the situation, Taoiseach Enda Kenny replied: “He expressed his understanding that there’s a bit of an obstacle here, but I explained to him that I expect this can be dealt with. However, there growing signs that electoral concerns could start to dominate discussions. The two main unionist parties this week agreed to a surprise election pact: the Ulster Unionist Party said it would not contest the upcoming Westminster parliament election in two constituencies, Belfast East and Belfast North; while the DUP agreed to back the UUP candidate in two constituencies, Fermanagh/South Tyrone, and Newry and Armagh. But after a meeting with the five parties later this week, British Direct Ruler Theresa Villiers insisted discussions were “constructive” and she was “encouraged that progress is being made”. His comment angered members of the Democratic Unionist Party (DUP). Justice spokesman William McCrea, who wrote a letter to president Barack Obama’s deputy. The South Antrim MP said Mr Biden should apologise for his remarks and “take corrective action” to prove people from a Protestant background were welcome at his home. * The Dublin government was also unusually sensitive to St Patrick’s Day remarks. Enda Kenny condemned Australian PM Tony Abbott, who said in a St Patrick’s video message that the Irish had given Australia its songs, and mentioned drinking “two, or maybe even three” pints of Guinness. The comments would be considered politically incorrect by some in Ireland, where the “stage Irish” image of Irish people singing and drinking is considered offensive. Mr Kenny expressed his displeasure to reporters on Monday after attending a private meeting at the US Chamber of Commerce. He said he “did not agree” with what the Australian prime minister’s comments.